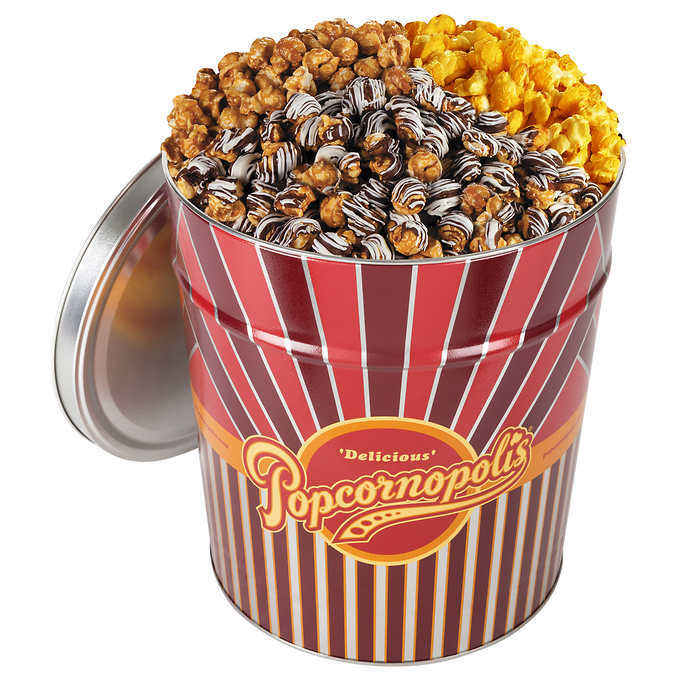 This extra-large bounty of gourmet popcorn features three terrific flavors. 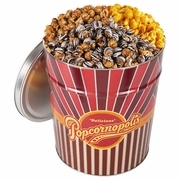 And with 75% more popcorn than a regular 2-gallon tin, you'll have "the goods" for even the largest crowd of gourmet popcorn enthusiasts! First off, Caramel Corn is an all-time favorite. Full of buttery flavor and sweet crispy crunch, this recipe is the one that put Popcornopolis® on the map! Next is the cheesiest, most robust Cheddar Cheese Popcorn ever conceived—a real crowd-pleaser. Last and NOT least: enjoy the unsurpassed delights of über-gourmet Zebra® Popcorn, an exquisite creation featuring Caramel and two kinds of confectionery chocolate. •	Zebra® Popcorn: Approximately 32.5 oz. (921g) •	Caramel Corn: Approximately 28 oz. (794g) •	Cheddar Cheese Popcorn: Approximately 13.75 oz. (390g) •	Serves about 35 people •	Certified Gluten-Free •	Non-GMO Corn •	Popped in pure coconut oil •	0g Trans Fat •	No High Fructose Corn Syrup •	Made in the U.S.A. Your item will arrive on or before the Preferred arrival date, if one was selected. If your item requires refrigeration or freezing, please do so immediately upon arrival.